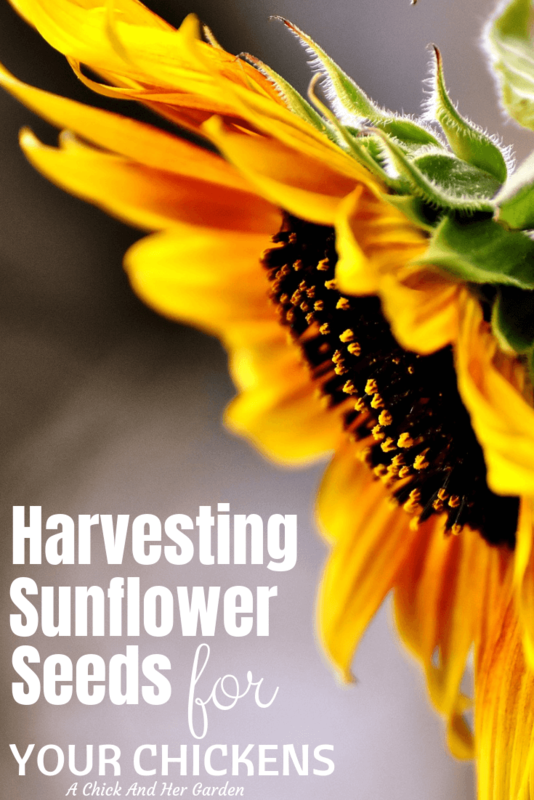 Have you ever thought about harvesting sunflower seeds for chickens? If you grow sunflowers, that’s free chicken food! Sunflowers are a staple beauty of summer time. They have a way of just making your surroundings seem happy and peaceful. I love the way they turn their faces to warm in the sun! But, beyond their beauty, we put them to work around here! 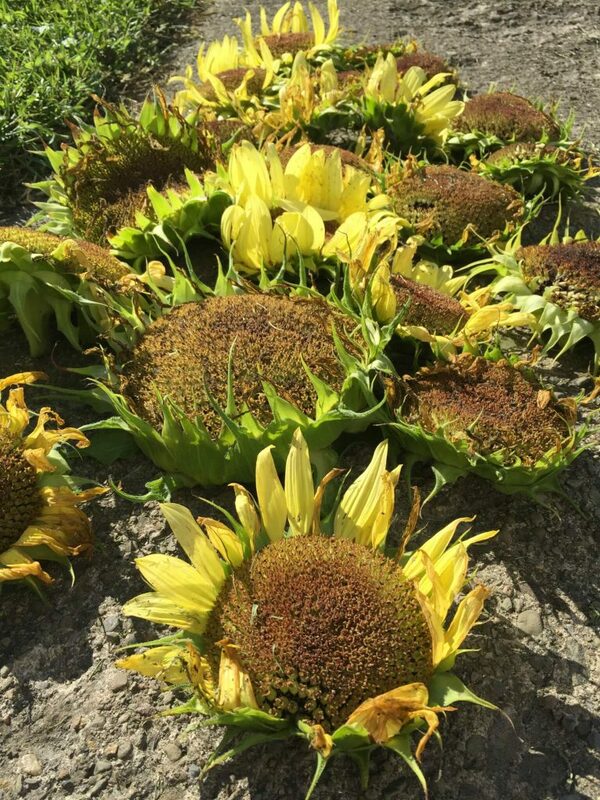 Learn how and why to grow sunflowers here! Our sunflowers are of course used to attract bees to our garden. But after they have started to droop and their petals have turned brown, they are recycled into a happy, healthy treat and boredom buster for our chickens! Sharing is caring! Pin me for others! Providing black oil sunflower seeds for chickens in the fall and winter will help their bodies prepare for winter. The oil in them is a fat that helps to add weight for warmth. Another benefit of this oil that you will see is a shine on your chickens feathers. This gloss helps to block out the cold and dampness that we most definitely experience here in Northwestern Pennsylvania! It is also said that black oil sunflower seeds will benefit the production and quality of the eggs your chickens give you! This weekend, while out in the garden, I noticed a few of those sunny faces drooping overhead and decided I’d start getting to work harvesting my free chicken food. Harvesting sunflower seeds for chickens is fairly easy, but can be a bit time consuming if you try and do it all at once. 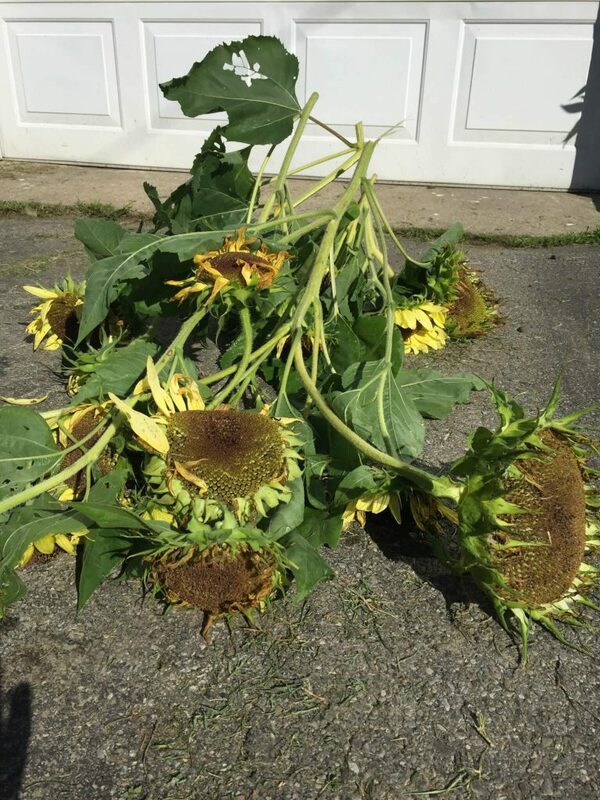 So, I suggest gathering up the flower heads as they start to die. Another suggestion is gloves! Typically I HATE wearing gloves in the garden. I feel like I’m a bull in a china shop and damage more plants than help them. But with this task you will be happy to have them. The black oil is sappy and coats your hands. It does not come off easily and leaves a piney smell. Here comes the messy part! Remove the flower heads from the stems and hold them in both hands. Use your thumbs to rub the flower heads. This will remove the tiny flowers covering the seeds. I also like to remove the petals (this is just preference and not required). 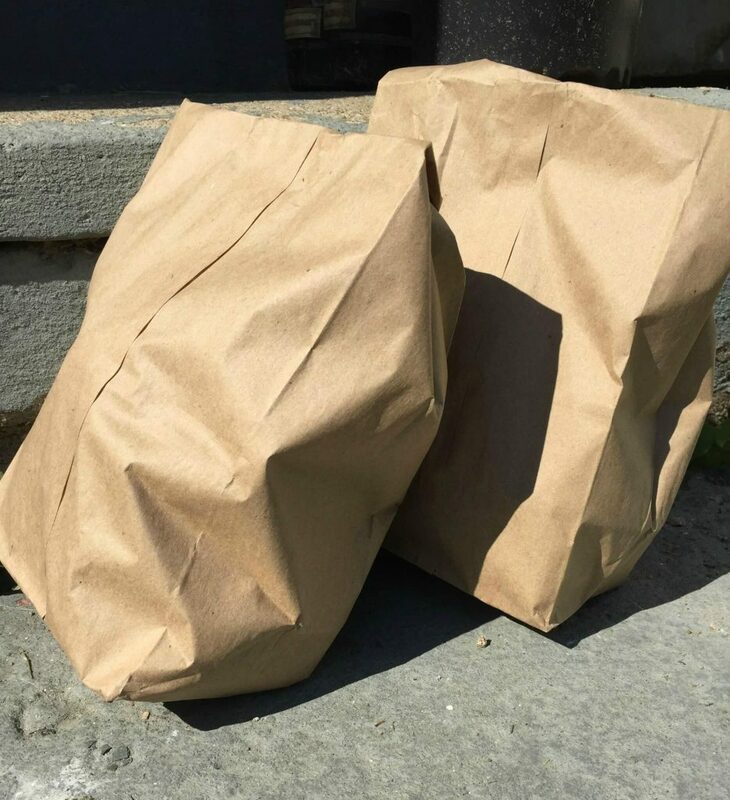 Store your seed heads in brown paper bags, in a dark and dry place. When you are ready to use your free chicken food you can either toss the whole head into the run as a boredom buster when they are all cooped up this winter, or rub the seeds loose from the head and add them to daily feed or to your fermented feed! However your choose to give them, your chicks are going to love you for it! Looking to raise dual purpose chickens like us? Grab a copy of Dual Purpose Chickens: Raise ‘Em Like Your Grandma Did for tips from brooder box to butchering! This post was shared on The Modern Homesteading Blog Hop, Our Simple Homestead Hop and The Homesteader Hop! I have always wanted to grow and save sunflower seeds! Thanks for the post! I’m glad that you liked it! I hope it’s useful when you grow and harvest your own! Do you feed shells and all? Yes. You can either leave them in the flower head or remove them to use as treats or to be added to fermented feed. I didn’t even think to do this! My ducks might like them… although we only had one sunflower and it was a volunteer. Next year I should plant lots. Thanks for linking up at #SustainableSundays! A great way to remove the majority from the head is to rub against the underside of a milk crate, saves your thumbs!